Broad-based economic growth is essential to sustainable, long-term development. It creates opportunities for raising living standards, provides countries with the resources to expand access to basic services and enable citizens to chart their own prosperous futures. Despite incredible progress that has reduced poverty and improved livelihoods around the world, global economic growth since 2008 has slowed and in some cases regressed. Today, three quarters of the world’s poor don’t have a bank account and access to capital remains a significant barrier throughout the developing world (USAID, 2013). Expanding Agricultural Growth and Investment: As agriculture growth and investment are subsets of economic growth, increasing growth of agricultural output and services increases jobs and rural incomes, while improved food security and nutrition improves labor productivity. Secure land tenure and property rights (LTPR) have long been recognized by USAID as a foundation for economic growth in both rural and urban areas. New international agreements, like the Voluntary Guidelines on the Responsible Governance of Tenure of Land, Fisheries and Forests in the Context of National Food Security (Voluntary Guidelines) highlight the importance of recognizing and respecting all legitimate tenure claimants and their rights. USAID policy statements and international conventions provide general policy guidelines, but do not delve into the causal linkages between tenure security and economic growth. This issue brief connects USAID’s programming on LTPR with economic growth and summarizes empirical evidence about these interrelationships where possible. This issue brief refers to the concept of “informality” as the situation found in many developing countries when landholders are deprived of the state’s protection and have no option to sell or mortgage property. Formalization means that previously informal land and business activities are brought within the law, and accorded recognition and protection by the state. The poor typically hold their land and conduct their business informally. Because of this informality, they are either not cognizant of or choose to forego economic opportunity, formalization benefits, or asset appreciation. Legal and policy reform can help lessen barriers and costs of formal economy participation. Governments have strong incentives from revenue and economic growth perspectives to promote formalization. Popular demand for formalization is driven by awareness of missed opportunities and the expectation of a benefit to follow. There are powerful groups who tend to oppose broader access to formality, including those who already are well vested and fear competition, lawyers and other professionals who benefit from complexity, bureaucrats who acting as gatekeepers might lose rent-seeking opportunities, and those who benefit from cheaper services provided by the informal sector. In North America, Western Europe, and Japan, most land is titled and registered and most business is conducted under formality. There is some space for informal business, but little for informal landholding. In South and East Asia, Latin America, Eastern Europe, and the post-Soviet countries, significant land rights have been formalized through land titling by the state, and titling is proceeding on a significant scale. In sub-Saharan Africa, due largely to the prevalence of customary land tenure systems, the majority of land is held under one type of formality but the level of protection provided varies widely within and between countries. There is significant diversity in the ability of these customary tenure systems to provide security and predictability in contractual obligations and in the definition and scope of transfer rights afforded to parties. While the majority of business conducted in sub-Saharan Africa takes place outside of the formal sector, formality tends to be higher in urban areas and rural areas that contain foreign investment. Case studies abound of how urban and peri-urban land markets operate; a recent case study in Bamako, Mali illustrates well the peri-urban tenure realities and their impacts on social relations (Becker, 2013). Greater formality is associated with businesses that operate in urban contexts. It is there that most registered businesses are located and much urban industrial, commercial, and residential land is titled. With respect to land, some areas of high informality manifest considerable tenure insecurity, e.g. : (1) illegally occupied areas, peri-urban squatter settlements or lands claimed as forest by the state, (2) land reform sectors where beneficiaries’ holdings have not been formalized, and (3) areas where there is extensive “tenancy” originating in former servile relationships. Businesses located in urban areas tend to conduct a greater proportion of their activities within the formal sector compared to their rural counterparts. Formalization does not mean formal land titling and registration; rather there is a continuum of land rights formalization that extends from strengthening tenurial rights in law to better communicating those rights to land holders to resolving conflicts associated with rights clarity to strengthening informal land leasing arrangements and contracts to formal titling and registration within both individual and group contexts. Because public interventions entail fixed and recurrent costs, USAID policy endorses principles of “secure enough” and scaling up land tenure security with need. However, there are different elements of land formalization that need to be clearly recognized: land law reform which recognizes and strengthens property rights; land titling which confers those property rights on landholders; and land registration, which provides a public record of those rights, facilitating proof and reducing transaction risks. Economic growth is generally defined as the change in Gross Domestic Product (GDP) or GDP per capita over time in a given country, region, or sector of the economy. Several studies have attempted to estimate the effect of providing land tenure security on GDP growth directly. Attributing impact of economic growth to land tenure and property rights interventions is typically very difficult and confounded by the complex development processes involved, and the inability to untangle or replicate control versus treatments in statistical designs. Nevertheless, outcome variables that can be linked more accurately to tenure security include investment, credit availability, poverty rates, land values, and agricultural productivity among the target group. Because these variables have been found to generate higher economic growth in many cases, they are reasonable proxies for growth. Evidence of the relationship between LTPR and economic growth of necessity must include some of these intermediate outcome variables. 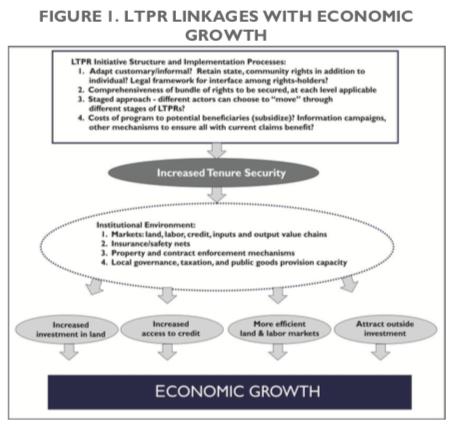 Figure 1 provides a conceptual framework outlining the linkages between strengthened LTPR and economic growth, as mediated by markets and institutions, from an input/resource flow perspective. Legal reforms must provide robust property rights of long duration, rights that confer freedom of management, are inheritable and protected by law from easy taking by the state, and the means to prove rights. This must take place within a rule of law environment that allows for effective vindication of rights in courts or other fora. These together provide security of tenure, vital for both social security and commercial production and use. If the right to alienate land is also part of the bundle of rights, the land may be transferred as needed or mortgaged to obtain credit. Once the land is marketable, the market will move land to those who can pay more for it and who will, in theory, use it more efficiently. Security of tenure thus increases investment incentives, and the ability to use land as security for loans eases credit access. Anticipated results include increased productivity per unit of land and profitability. Not shown in Figure 1 is the potential of the same measures to increase the market value of land, speed up economic capitalization, and allow development of secondary markets in securities. These economic growth outcomes are also mutually reinforcing; growth in agricultural output and business growth depends on the existence of complementary institutions and public infrastructure, such as well-functioning credit, land, and labor markets as well as transportation infrastructure, electricity, and schools. At the macroeconomic level, land tenure and property rights interventions can thus have a direct effect on production (e.g. through long-term investment or expanded credit access) or an indirect effect by enabling roads and private and public investment in infrastructure that complements productive activity. The reverse is also true: large-scale investments in public infrastructure, goods, and services will have muted impacts on economic growth when and where a large portion of the rural population is subject to insecure tenure. To avoid such pitfalls, policy recommendations include evaluating alternative LTPR program designs and implementation processes, and ensuring that complementary institutions are in place so that equitable and broad-based economic growth can be realized. In general, the impacts on economic growth in the rural sector will be greater where necessary market, finance, and legal institutions are in place. Broad-based gains are most likely to materialize when policies and programs to increase tenure security benefit those currently holding insecure rights to land. A number of researchers have noted that expansion in the farm economy can have strong positive impacts on overall economic growth and food security as resources are released to foster higher-valued, rural, non-farm activities and urban-based, private sector enterprise development, particularly in countries where the agricultural sector is still an important source for labor and incomes of the poor (Diao et al., 2010; Gollin, 2010; Haggblade and Hazell, 1989). Byamugisha (1999) conducted one of the few national-level studies looking at the effect of a titling program on economic growth while controlling for confounding effects. The author tested the effect of a land titling program (see Box E) on economic growth directly using time series data from Thailand and treating the implementation of a land titling program as the key independent variable. Results show a negative correlation between land titling and contemporaneous economic growth in the short term, but a positive correlation between the two in the long run. Results also show a positive correlation between quality of land registration services (measured by public expenditures on land registration) and economic growth. As the world becomes increasingly urbanized and industrialized, issues of land tenure and property rights in the context of investments in transportation and utility infrastructure and residential and commercial building construction become increasingly important drivers of economic growth. Unfortunately, millions of urban dwellers in developing countries live without adequate security of tenure or property rights. Reports from the United Nations expect this group to reach 1.5 billion by 2020. This increase in population leads to expansion of municipalities and public takings for urban infrastructure and settlement (thereby increasing demand for secure property rights to encourage investment), eminent domain law to enable payment of fair and adequate compensation along with legal recourse in the case of public takings, and public investment in regulated spatial planning (see Voluntary Guidelines, 2012). However, such investments also require caution, particularly in cases where individual or community holders of rural land are not recognized as rightful holders of property by state or local government (hence are at risk of displacement), or governments lack public resources via taxation to pay for compensation. Rising consumer incomes along with accelerating economic growth and prosperity also increases demand for rural land for roads, pipelines, bridges, and electrical transmission infrastructure among other public investments. A major policy issue is who holds the rights to large tracts of property through which infrastructure developments pass (i.e. rights of way), or the land (and use of surrounding resources, e.g. timber or water) on which costly fixed place investment takes place. Tenure insecurity in such instances reverses the common tenure security and investment linkage as government through eminent domain can exert authority through its public takings. It can also transfer rights to the private sector via concessions as in the case of siting industrial plants. However in these cases, the concern is less whether governments provide adequate tenure security to the concession holder (which it generally confers) but whether informal land holders (individuals and communities) receive fair, prompt and adequate compensation for resources and livelihoods lost in such takings, and whether they provide for public consultation and due recourse. The World Bank and Millennium Challenge Corporation provide guidelines to protect rightful land and property holders in the case of involuntary resettlement (see Involuntary Resettlement Sourcebook, Planning and Implementation in Development projects) as do the Voluntary Guidelines (Part 4). USAID/Afghanistan’s Land Reform in Afghanistan (LARA) Project (January 2011 to January 2014) worked with the Municipality of Jalalabad and 2 informal settlement communities in a mutually beneficial process that supported both the recording of approximately 2,500 land claims and capacity building of Municipal staff in terms of land administration, land use planning and settlement upgrading. Communities participated in roads and drainage planning and construction as well as contributed to the government’s better understanding of land occupation within its municipal boundaries. It is anticipated that the very nature of land occupation recognition (through data collection and infrastructure development) will contribute to improved security of land tenure within the target areas as well as continuing local investment. For both urban and rural infrastructure, a range of policy instruments become important, including regulations governing the operation of land and real estate markets, titling and registration, valuation, taxation, zoning, spatial planning and trans-boundary resource management (whether between urban and rural, or between international, state and local governments), for example as used in USAID Afghanistan’s land reform program (box A). In such cases, the impact of land tenure reform interventions are all too obvious when public investment is the focus. The greater challenge is whether similar interventions are possible with land tenure interventions alone, because such costly investments typically require a complex confluence of factors: enabling government, pro-business rule of law, legal recourse, good governance and public resource management, and availability of private capital mobilization (public-private partnerships) in addition to improved financing. Expansion of informal settlements is also becoming an important issue, particularly in contexts where the property rights regime is weak and discourages public and private investment, burgeoning populations (particularly of the poor) overwhelm public infrastructure and delivery of public services, and weak city and municipal tax base curtails public spending (see box A). It also occurs in conflict settings when residents flee to cities for security and once there claim the property settled to be theirs. In an effort to address land and property rights security, governments and international funding agencies have adopted land use planning along with titling and registration to help regularize and plan urban settlements, provide security of tenure to increase investment in housing and building stock, and enable municipal taxation systems to increase public coffers for undertaking infrastructure and public service delivery. There are nonetheless risks that need to be accounted for in policy and program design, such as speculation and profit taking as informal settlements are upgraded, eviction of tenants due to higher rents, and expansion or new unauthorized settlements in hope of being awarded titles and the benefits of informal settlement upgrading. Beyond the need for individual security of tenure providing people and businesses with incentives to renovate or construct costly structures to meet basic human needs and demand for commercial services, municipalities need revenue to provide for urban investment, infrastructure and public good delivery (see Box B). Many municipalities in the developing world lack capacity to undertake land use planning and complementary LTPR interventions like land titling and registration systems that formalize the holdings of individuals and businesses; public consultation and transparency in land use planning decisions; land valuation and payment of fair, prompt and adequate compensation in the event of public takings and expanding urban perimeters; and property valuations to levy property takes to pay for public services. Following decades of internal conflict, USAID/Colombia’s new Colombia Land and Rural Development Program is expected to play a catalytic role in building government capacity to restitute land to victims, extend land formalization in priority areas, and promote sustainable rural development. Colombian municipalities are currently challenged with facilitating sustainable livelihoods and providing basic municipal services to restitution/formalization beneficiaries. LRDP will assist these municipal governments to increase real estate tax revenues contributing to broader efforts to finance infrastructure projects and rural development programs. LRDP’s land- related interventions will provide tenure security for Colombian citizens and will simultaneously enhance municipal capacity to improve public service delivery. While securing property rights for individuals and businesses may be justified in and of itself to enable residential and business construction, for many municipalities in the developing world the goal is registered land that can be valued and used to assess property taxes to augment public revenues. When combined with good governance (transparency, accountability, participatory planning and watchdog oversight of expenditures, and avoidance of corruption), land titling, registration, valuation, land use planning and zoning help to regularize the development process and contribute to economic growth via the public and private investment that is enabled. However, lacking good governance, the same individuals and businesses can opt for informality and tax avoidance until the wrongful behavior is corrected and the benefits of public investment are made evident. LTPR has only an indirect effect on product markets related to the role of increased tenure security on investment and output thus influencing the flow of marketed surplus and product flows in markets. However, secure rights in land and property enable land transfers and increase land and real estate market efficiency by allowing farmers and entrepreneurs to allocate land and labor to their best alternative uses while minimizing time-consuming disputes over land use. Secure rights reduce transaction costs and lead to efficiently functioning land markets by reducing disputes over land ownership and enabling smooth land transfers. Successful farmers and entrepreneurs will more readily buy, rent or exchange land and property, while less successful farmers and entrepreneurs will choose to sell or rent out land. In these cases, not only will land tend to be allocated to its best use, but so too will labor (Byamugisha, 1999). Land markets that are sufficiently developed and well-functioning institutions that hear disputes and enforce agreements are crucial complements to land tenure interventions that promote land transfers via sales or leaseholds (Barrows and Roth, 1990). Additionally, sufficient off-farm labor opportunities are typically required to realize gains from reallocating labor. In rural areas, secure tenure rights increase the likelihood that farmers making investments in the present will be able to enjoy the returns to those investments in the future, and can pass down improved land to heirs (Place and Otsuka 2002, and references therein). This mechanism will have bigger impacts where returns to these investments are relatively high, e.g. where well-functioning markets ensure farmers are able to obtain agricultural inputs and technology as well as sell surplus production at favorable prices. Informality means that landholders are deprived of the state’s protection, nor will they have the option to sell or mortgage their land with formal sector credit institutions. The influential and powerful are less vulnerable to this risk than the poor, because they can mobilize forces other than rule of law to protect their holdings. They also have other security to offer for loans. The poor feel the full force of insecurity, and it undermines their incentives to invest and produce as well as the possibility to gain access to medium- and long-term mortgage credit through use of land as collateral. Another negative impact is felt among local authorities that are deprived of a valuable source of revenue from property and income tax, leading to lack of basic services for the poor. However, taxation that is onerous, unfair, or administered by corrupt governments without transparency or accountability will also tend to encourage landholders and business to seek out and maintain informality. While there are studies that bear out the theoretical connection between land titling and investment, (Feder and Onchan  and Alston, Libecap, and Schneider ), this is not necessarily the general case. For example Deininger and Chamorro (2004) find registration increases land values but otherwise has little impact on access to credit, investment, or productivity. Major comparative reviews by Bruce and Migot-Adholla (1994) and Feder and Nishio (1996) suggest that titling’s impact on investment and credit is most likely to be effective where robust formal financial markets exist and where there are incentives for investment created by proximity to urban markets and good quality land. Studies that dig into impacts on the poor (e.g. Carter and Olinto 2003) suggest that credit and other benefits may be heavily skewed toward large landholders. There is real concern in developing countries that marketability and ‘mortgageability’ of land resulting from formalization will fail to deliver empowerment of the poor, but may instead increase landlessness through desperation sales or foreclosures after ill-considered borrowing by poor landholders. Carter and Salgada (2001) suggest the poor tend to lose out in land markets, and some major comparative studies have concluded that this is often the case (De Janvry et al 2001). The most serious problem stems from credit market imperfections. Potential value in urban uses tends to drive up the value of land beyond what rural producers can afford. Small landowners often have difficulty accessing credit using land as collateral, with or without a title; the loan amounts are modest, the costs per loan high, and problems of foreclosure and disposal disproportionate. Understanding the role of credit markets in relation to land formalization has led to important recent shifts in donor land policies, particularly at the World Bank where it is now accepted that, for land markets to move land to the poor, targeted credit must be provided (Deininger ). Legal reforms that enable (or ease restrictions on) land and property transfers and increase access to formal credit can facilitate production and consumption activities, both important determinants of economic growth. Increased access to credit can speed up financing of desired investments. Importantly, this can only happen where rural financing institutions can and do respond effectively to increased demand on the part of newly collateralized farmers (World Bank, 2003). The extent that rural financing institutions expand credit will in part be determined by whether plots are of sufficient value and whether foreclosure in the event of default is socially feasible (Deinenger and Feder, 2001). In practice, however, the linkages between formal land title and access to credit and investments are often mooted by capital market imperfections and the weak bargaining position of the poor in land and financial markets (Box C). However, there are different elements of land formalization that need to be clearly recognized: land law reform which strengthens property rights; land titling which confers those property rights on landholders; and land registration, which provides a public record of those rights, facilitating proof and reducing transaction risks. Formalization serves to expand the potential transaction partners that are available to a business by decreasing the risk associated with undertaking impersonal transactions through state-administered contract enforcement. Besides increasing a firm’s sourcing or marketing options, business formalization helps to improve credit access. This benefit appears to be intensified in legal systems that allow the use of movable collateral such as inventory and accounts receivables. Unfortunately, compared with land, there is a dearth of empirical work on the impact of formalization on business performance. The empirical research on the impact of business formalization is limited by the scarcity of reforms and the obvious methodological problem of measuring a portion of the economy that is, by definition, beyond government’s control. These obstacles have effectively prevented cross-country comparisons of formalization policies, leaving primarily descriptive studies of single countries. There is nonetheless some evidence that formalization policies promote economic development. Howell (2002) finds that policies pursued by the Shanghai Municipal Government to address high unemployment were successful in facilitating newly unemployed workers’ transition into the formal economy. A large-scale formalization program led by the ILD, based in Peru and El Salvador from 1982 to 1996 succeeded in formalizing 300,000 enterprises and increasing annual tax revenues by $300 million. The program cites the creation of 560,000 legal jobs in Peru and $9.4 billion in net benefits having been attained by the poor there. While formalization policies in Peru, El Salvador, and Shanghai appear to have been beneficial to growth, there is evidence suggests that these results are contingent on domestic factors. Batra and Mahmood (2003) find that direct government support to private enterprises (e.g. subsidized finance or business development services) is not effective in increasing firm performance when the country lacks a sound business environment. Sanders (2002) finds similar failures in measuring the effectiveness of a US government technical assistance and credit to American micro-enterprises to promote economic well-being and to integrate firms into the formal economy. The study found no statistical difference between firms that participated in government programs and the control group. A common assumption among policy makers is that once formalization costs are reduced, business will flourish. Registration reforms that target costs and the length of time required are the common recipe for business formalization. But different factors may affect the success of these policies. For example: costs and time required to enter and exit a market is reduced but businesses do not feel a tangible benefit in the formal economy; business formalization is unknown to informal businesses; different businesses in the informal economy require different remedies to foster formalization; the formal market is overwhelming in terms of competition; the informal economy is resistant to change or has its own ways of doing business; informal business fails to embrace formalization policies because they lack access to credit and training; rampant corruption in the formal sector dissuades informal businesses from formalizing; and poor dispute settlement mechanisms and services and infrastructure affect the formal sector’s appeal for informal businesses. In general, informality tends to be high when business regulations are strict and when direct and indirect government-imposed costs associated with attaining and maintaining legal compliance are high. Informality tends to represent a large part of output in countries where the costs of starting or operating a formal business and time spent ensuring legal compliance are onerous. While pervasive public corruption appears to increase informality, the evidence concerning the impact of taxes on informality does not all point in one direction. While some studies observe that high taxes increase the size of a country’s informal sector, there are other contradictory results that have not been explained. Secure tenure rights increase incentives to make productive investments on farm. An efficient, stable, and growing agricultural sector is more likely to attract external and domestic investment necessary for broad-based economic growth. Additionally, gains in agricultural productivity and sector growth can subsequently have large multiplier effects on economic growth in both the rural non-farm and urban sectors. A more efficiently functioning agricultural sector will be more attractive to outside investment, allowing farmers who wish to increase the scope and scale of their operations to find investment partners more easily and spur the further growth of their businesses, further enabling economic growth of the rural sector (FAO, 2002; De Soto, 2000; Delgado et al., 1998). Attracting outside investment also requires complementary investments in institutions for contract enforcement and sufficient political and macroeconomic stability. Also, for such investment to have a positive impact on local development, it must include local smallholders. If there are solid legal systems protecting the rights of smallholders, then they will be more likely to be consulted and properly compensated if outside investors wish to purchase their land. Furthermore, when smallholder tenure is secure, investors will be more likely to engage in joint ventures, contract farming, and agreements with cooperatives instead of just buying land (Hallam, 2009). This type of investment often has a substantially greater impact on local economic development and poverty reduction than large-scale land purchases. In rural areas, four mechanisms link secure LTPR to economic growth. First, secure tenure rights increase the likelihood that farmers making investments in the present will be able to enjoy the returns to those investments in the future, and can pass down improved land to heirs (Byamugisha, 1999; Place and Otsuka 2002). This mechanism will have bigger impacts where returns to these investments are relatively high (e.g., where well-functioning markets ensure farmers are able to obtain agricultural inputs and technology as well as sell surplus production at favorable prices). Second, they may increase access to credit so landholders can more easily finance on-farm investments as well as increase engagement in market-based entrepreneurial activities. Third, secure rights that enable land transfers through the market increase efficiency in rural areas by allowing farmers to allocate both land and labor to their best alternative uses while minimizing time-consuming disputes over land use. Fourth, an efficient, stable, and growing agricultural sector is more likely to attract external and domestic investment necessary for broad-based economic growth. Additionally, gains in agricultural productivity and sector growth can subsequently have large multiplier effects on economic growth in both the rural non-farm and urban sectors. Though the empirical literature is skewed toward titling/registration, it nonetheless provides strong evidence that strengthening LTPR can only foster economic growth when the design and implementation take into account specific circumstances of existing claimants, and when complimentary institutions and public infrastructure are in place. Given the mixed results of earlier, costly land titling programs, alternative programs for securing a broad range of land tenure and property rights have been pursued. These include legally recognizing community/tribal ownership, legally defining rights of users on state land, providing farmers with certificates of occupancy rather than full titles, establishing community land trusts, and employing other methods which maintain existing aspects of customary land use systems while increasing tenure security and stimulating land markets (Toulmin, 2009; Arko-Adjei, 2011). Although credit impacts have historically been used to justify land tenure and property rights interventions, existing empirical evidence suggests that increased internal investment is perhaps the most important outcome of these projects. Deininger and Chamorro (2004) found that farms that received formal title in Nicaragua in the 1990s saw an 8-9 percent increase in propensity to invest and a 30 percent increase in land values compared to farms lacking formal title. Holden et al. (2011) and Deinenger et al. (2011) also find increases in on-farm investment resulting from Ethiopia’s recent land certification program. Evidence for increased credit access is more mixed (USAID, 2006). In studies of the Thailand Land Titling Project (see Box E), for example, researchers found that land titling increased access to formal credit by 75-123 percent, allowing farmers to benefit from interest rates 27 percent lower on average than in the informal credit sector (World Bank, 2003; Burns, 2004). However, Carter and Olinto (2003) found that land registration did not increase credit access for the poor in Paraguay, but did increase credit access for wealthy farmers. Thailand had a land titling system as early as 1901. However, by 1984 only 12 percent of occupied agricultural land was held under formal titles (Burns, 2004). The Thailand Land Titling Project (TLTP) was introduced that year with the goal of issuing formal titles to all remaining eligible landholders. Costs of the project were fairly low, at around $39 per title (Pagiola, 1999). A number of outside evaluators have judged the project to be very successful. By project close, 13 million households received land titles. Land titling was found to raise property values by 75-197 percent and increase access to formal credit by 75-123 percent, allowing farmers to benefit from interest rates 27 percent lower on average than in the informal credit sector (World Bank, 2003; Burns, 2004). Several studies found that land titling increased use of seeds and fertilizer, yields, and land transactions, though these outcomes varied across different regions of the country (Pagiola, 1999; Burns, 2004). Suggested reasons for the success of TLTP include Thailand’s long history of private land tenure, which meant land titling did not represent a sudden cultural change; implementation by a well-organized and experienced body, the Department of Lands; and strong commitment to the project over 20 years by both the government and outside funders like the World Bank (Rattabirabongse et al., 1998; Burns, 2004). Finally, the Thai government also invested significant resources in complementary programs, including widespread provision of credit by the Bank for Agriculture and Agricultural Cooperatives (Burns, 2004). With respect to improved functioning of land markets, Boucher et al. (2004) found a significant correlation between land titling and land market activity in Nicaragua and Honduras. However, others studies found no correlation between land registration and land market activity, including Do and Iyer (2008) in Vietnam. Increasing outside investment is the least studied empirically. External investments in agricultural land in developing countries increased to record levels after the 2007 and 2008 global food price spikes. However, despite the theoretical argument that increased tenure security through land titling programs might increase outside investment and spur economic growth, according to Deininger, et al. 2010, much of the post-2007 reported investor interest has targeted countries where local people have insecure land rights. This may demonstrate that tenure security is simply less important in attracting investment than expected returns to agriculture due to price increases, or perhaps that areas with less secure property rights for locals actually attract external investment, since the government is able to cede large tracts of land to investors without concern for the rights of local tenants. One reason for the heterogeneity of land titling program results is that the success of the mechanisms in stimulating investment, productivity, and other growth outcomes depends on the presence of well-functioning markets for land, credit, inputs, and labor (Boucher et al. 2004; Musembi 2007). Positive results appear to be more likely in more advanced, population-dense countries with greater market, financial, public transportation and energy infrastructure, and for farmers who are already better off. In areas where customary land systems prevail, there may not be sufficient gains to warrant individual titling. Empirical evidence to support this latter point is found in Chimhowu and Woodhouse (2006), who provide a great deal of case study evidence of customary land tenure systems with active land markets, and de Janvry and Sadoulet (2001) who document a number of examples where investment and production under customary/communal tenure was the same as that under private tenure, for both cinnamon production in Sumatra and cocoa in Ghana. Nonetheless, as pressure on limited land resources for food and biofuel production increases, there may be a need to provide more limited formalization to customary systems. The success of the Thailand TLTP, however, shows that registration and titling system can increase incomes across all types of farmers. This is largely attributed to the program design and implementation process, as well as the development of complementary institutions. With respect to outside investment, several scholars have suggested that strong regulation is needed so that foreign purchases of private freehold land do not disenfranchise local farmers at the expense of wealthy companies (Deininger, et al. 2010). Finally, stimulating broad-based economic growth in the agricultural sector generally has large positive spillover effects on rural non-farm and urban economic growth, particularly in relatively poor countries where the majority of the labor force is still largely dependent on the agricultural sector (Diao et al., 2010; Gollin, 2010). Of course, major increases in agricultural productivity will generally require complementary investments in public infrastructure and the legal and regulatory environment for investment, as well as secure LTPR. Many observers now suggest that formal land titling programs leading to rapid private ownership may not be the best or only way to secure LTPR and promote balanced economic growth. Rather, USAID policy endorses principles of “secure enough” and scaling up land tenure security consistent with affordability, sustainability and a continuum of rights. There are a number of alternatives to formal land titling that can help to create more secure land tenure while avoiding the pitfalls of individualized freehold tenure systems, including the exacerbation of inequality. These include policy and legal recognition of customary rights; issuance of certificates that secure usufruct, management, and/or inheritance rights; or community titling (Delville, 2010; Bassett, 2005). There is also some empirical evidence that suggests that a more flexible tenure model should be used to retain elements of customary tenure and encourage a more gradual transition to a freehold system. This is particularly likely to be true in systems where multiple, overlapping property rights act as an insurance mechanism, such as in free-grazing livestock systems (Niamir-Fuller, 1999 and case studies therein). Being able to access communal land in response to poor realizations on one’s own land serves as a safety net, which can be particularly important where few other safety net mechanisms exist. More gradual transitions allow for the concomitant development of complimentary institutions and may lead to more equitable distribution of strengthened LTPR, as beneficiaries have more time to familiarize themselves with the process. Several alternative systems partially maintain customary tenure. For example, in Namibia the government is developing a flexible approach which builds incrementally on customary rights, providing a continuum of rights via occupancy licenses, “starter titles,” and certificates of occupancy rather than offering freehold title as the only option (Arko-Adjei, 2011). In other countries, for example Ghana and Botswana, land boards made up of traditional leaders or elected officials are involved in both the decision making about what rights should be recognized and protected, and implementation of the land registration process (Arko-Adjei, 2011). In Mexico, the 1992 land reform contained mechanisms for individuals in the community to vote on how the bundle of property rights would be altered on issues, for example, such as whether communal pastures or forest would remain communal or instead be divided among rights holders (Deininger and Bresciani, 2001; de Janvry et al. 2011). Another alternative structure is the Community Land Trust (CLT), where land is owned by communities but improvements made to the land, such as houses, are owned by the individuals. Still another option is to retain state ownership and control over at least some land, which could potentially make it easier to capture economies of scale and/or to continue providing land access to those who would otherwise be landless and marginalized under a freehold, liberalized tenure system. In the late 1990s, the Ethiopian government introduced a land titling system which has proven successful and managed to avoid many of the pitfalls of other land titling programs. Ethiopia’s program is the lowest cost land titling program ever implemented, at only $1 per parcel, compared to $20-$60 on average in other titling programs (Burns, 2007). Costs are kept low because local land administration committees are set up in each community, and farmer members are trained to implement land measurement and registration themselves (Deininger et al., 2009; Toulmin 2009). Within five years, 20 million plots were registered to 6 million households (Deininger et al., 2009). The program departs from traditional titling interventions in a number of ways, in particular by issuing non-alienable use right certificates, rather than full titles. Its use of local land administration committees is unique and helps to strengthen the legitimacy of the program. Female-headed households are able to register land in their name, and husbands and wives are jointly certified as owners (Arko- Adjei, 2011), helping to avoid the disenfranchisement of divorcées and widows seen in Kenya (Holden and Tefera, 2008). Women’s rights were further strengthened by a federal provision that requires the consent of both spouses to make a decision to rent out or sell the land. Two separate empirical studies (Holden et al., 2011; Holden and Tefera, 2008) found that the land registration program in Ethiopia has increased perceptions of tenure security, decreased border disputes, increased investments in trees planting and soil conservation structures, and raised agricultural productivity. Holden and Tefera (2008) also found that poorer households have the same probability of receiving land certificates as less poor households under the program. To date, there is little empirical evidence on the outcome of such alternatives. For example, Ethiopia has implemented an alternative tenure registration system through local land administration bodies (see Box F), and it has widely been recognized as successful in increasing tenure security of both men and women, increasing on-farm investments, and raising productivity (Holden et al., 2007; Holden and Tefera, 2008). On the other hand, Basset (2005) conducted a six-year study of the implementation of CLTs in Voi, Kenya, in comparison with an individual tenure system implemented in nearby Kilifi, Kenya. Results showed that although absentee ownership was slightly lower and land was more affordable in the CLT area compared to the area with individual tenure, the positive results were weak, and the overall conclusion was that goals were not met due to complexity of the legal structure of CLTs, lack of continued government support, and conflict over allocation of additional parcels. agricultural production, yields, and rural employment ever seen. While most CEE and some CIS countries also saw the agriculture sector rebound over time (Lerman et al., 2004), the rapid transition led to a period of massive disruption with negative consequences for those dependent on the rural economy. By contrast, during their transition periods, both China and Vietnam implemented a more gradual approach, retaining state ownership of most land and transferring only usufruct rights to tenants, and they saw dramatic increases in agricultural productivity and growth (Pattinson, 2000). This may be because during gradual reform, the existing complementary financial and legal institutions are not massively disrupted, and new institutions suited for the free market have more time to develop and mature. For example, in China and Vietnam, the state largely retained control over the supply of inputs and the purchase of farmer production during transition, and in both cases the states played a major role in developing new institutions necessary for the free market system, such as contract enforcement and credit markets (Roselle and Swinnen, 2004). A number of empirical studies in the literature suggest that high levels of inequality are ultimately detrimental to GDP growth (Davis and Hopkins, 2011; Bardhan and Mookherjee, 2006). This insight is particularly important in the context of strengthening LTPR. To the extent that the relatively poor and marginalized people currently face greater insecurity, well-structured and well-implemented programs can have progressive impacts on the distribution of secure land assets, reducing overall inequality. This in turn can lead to broad-based economic growth in both rural and urban areas. Making land distribution more egalitarian is the main goal of land reform, which has been found to increase tenure insecurity in certain areas of China and Vietnam, for example, as well as Ethiopia and Eritrea (Deinenger and Jin, 2006; Jacoby et al., 2002). Providing more secure rights must be perceived as permanent for many of the hoped-for benefits to be realized. Importance of Assessing Customary Tenure Systems. Before implementing any land reform or land titling program, a thorough analysis should be conducted of the existing customary tenure system to understand its strengths and weaknesses and best determine how to engage with this system. Constitutional Provisions and Women’s Rights to Land. Where existing customary systems support vibrant land market development, provide adequate investment incentives, and do not disenfranchise women or other groups; only very minimal changes should be made. The best approach may simply be to write national laws which recognize and protect customary tenure rights. Intermediate Forms of Tenure Security. In cases where customary tenure provides some benefits but (1) does not adequately incentivize investment, (2) disenfranchises certain groups, or (3) perpetuates low levels of productivity, intermediate forms of tenure reform should be considered. This can include support for instruments like local land boards or Community Land Trusts, which provide both individual and community-level rights simultaneously. Gradual and Appropriate Privatization. Where state or communal ownership is widespread and complimentary institutions are weak or absent, it is likely that a more gradual process of privatization with associated land titling would result in more cost-effective, productive, and equitable outcomes. In these cases, government should initially focus privatization initiatives around high-value lands (e.g. irrigation sites, reforestation plots, peri-urban areas). Importance of Participatory Land Registration. Land registration programs should be as participatory and transparent as possible, both to increase legitimacy and to reduce cost. Tenure Formalization and Accompanying Measures. Where more formal, individualized systems are pursued, efforts need to be made to develop functioning credit and land markets and/or other support mechanisms for new landowners, such as cash transfers, technical assistance, information/awareness programs, and access to low-cost dispute resolution and contract enforcement mechanisms. Monitoring Land Titling to Avoid Disenfranchisement. Where land titling is implemented, it must be carefully monitored to avoid capture by elites and widespread disenfranchisement of the poor and/or women. Hybrid structures which retain some community control over land, as well as provisions like joint registration of land in the name of a husband and wife, should be considered. Flexible Titling Options to Minimize Inequality. Exacerbation of inequality can also be avoided by providing a spectrum of flexible titling options, including certificates of use, occupancy certificates, and starter titles, which may be more affordable for poor farmers and slum dwellers.